Ecobank Management Development Programme (EMDP) 2018, The Location of the Recruitment is Nationwide and Eligible Applicants Must be Graduates not more than 28 years old by December 2018. 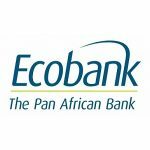 How to Apply for a Job at Ecobank, Interested and Qualified Candidates Should: Click here: e-recruiter.ng to apply, Application Deadline 4th June, 2018. Ecobank Development Corporation (Ecobank Capital) is the investment banking and securities trading company of Ecobank Transnational Inc., the Pan African financial institution with banking and financial services operations across 34 countries in Africa, United Arab Emirates and the United Kingdom. We operate across 5 regional offices in Africa namely: Nigeria, Ghana, Kenya, Cameroun and Ivory Coast. The EMDP – Ecobank Management Development Programme is an intensive program designed to build the bank’s talent pool in order to raise a new generation of leaders for Ecobank. Candidates that undergo this program will upon completion be placed in positions aligned with their skills, experience and strengths at the entry point of functional managerial roles. A robust selection process which includes assessment centers, team projects etc. Apply on or Before: 4th June, 2018.